My cousin Kathi, who was more like a sister to me, died of lung cancer in December 2003. She was 46 years old. At the time, I didn’t know the first thing about lung cancer. Since Kathi smoked for years, I thought that’s why she got lung cancer. I didn’t think too much more about lung cancer for the next year, although I thought about Kathi every day. Then, about a year later, I had a sharp pain in the right side of my chest, like a knife stabbing through my chest and back. I thought that I might be having a heart attack. I exercised regularly, ate fairly well, and was always concerned about heart disease because my dad had died of a heart attack at age 40 and 3 of my grandparents had died of heart disease. So I knew it ran in my family. My husband took me to the emergency room and after lots and lots of tests, it was determined that my heart was fine, but they found this tiny little mass on my left lung. I was told by my family doctor that it was very possibly lung cancer. But my pain was on the right side…. The tumor was on my left lung. This didn’t make any sense! They never did find out what that pain was. It definitely wasn’t the cancer. All I can say is that somebody was trying to tell me something. If I had not gone to the emergency room that day, my cancer would most likely not have been diagnosed until it was too late, like Kathi. After a pet scan, I was sent to University of Maryland in Baltimore to see a lung cancer specialist. They immediately did a lung biopsy which confirmed their suspicion. It was non small cell lung cancer. How could I have lung cancer? I was only 46, I didn’t smoke, I exercised 5 to 6 times a week, I had regular check ups, I ate well….how could I have lung cancer? I immediately got on the internet and began researching lung cancer. What I saw was very disturbing, to say the least. The only statistic that I could remember from that evening was that 95% of lung cancer patients do not survive more than 5 years! I was just devastated. I wouldn’t be able to see my daughters grow up, I wouldn’t be able to see my grandchildren. Now how was I going to tell my daughters? They had just watched my cousin die of lung cancer! I told my younger daughter first, she was 11 years old at the time. As I looked at her, a fierce feeling of determination came over me. I WILL fight this, and I WILL beat this! I have to. My kids need me and I need them! I explained to her that mine was a different type of lung cancer than Kathi had and that it was found very early, unlike Kathi’s. I was trying to downplay it as much as I could to prevent her from worrying. And it worked. Several months later I was sitting at my desk at home, and she saw a Lung Cancer book on my desk. She came over, picked up the book, read the title and said “Oh Mom, you didn’t even have it that bad!”. My older daughter was away at college at the time, so I called her and asked her to meet me for lunch. She was 20 years old. I explained it to her just like I did to my younger daughter. They both seemed to take it very well. I was then sent for more tests and finally some good news! The cancer had not spread to my lymph nodes. It looked to be contained in one of the two lobes of my left lung. This meant that I was a candidate for surgery, which meant the best chance of a cure! I was diagnosed at Stage 1A. So, on April 20, 2005 I had the upper left lobe of my lung removed at the University of Maryland Medical Center. I was able to have VATS surgery, Video Assisted Thoracic Surgery. The day I came home from the hospital, I tried to walk up the stairs at my house. About half way up, I stopped and couldn’t breathe. I had to sit on the step for about 5 minutes to catch my breath. It was then that I realized that life would probably never be “normal” again. But, I was on the treadmill walking two weeks after surgery and back in spinning classes 4 weeks after surgery. I was determined to get back on that spinning bike and continue like I still had two lungs! The first question people ask me when I tell them that I am a lung cancer survivor is “DID YOU SMOKE?” I think non-smokers ask because they hope I’ll say yes, so they can feel safe. But none of us is “safe”. What’s so awful about that question is that if you are a smoker, you probably feel horrible about it. Almost everyone who smokes wants to quit – the majority of the people started when they were young and got addicted. Anyone who is diagnosed with cancer will ask themselves, “Why Me” and try to figure it out. The thought that you may have brought it on yourself is devastating. Do they deserve the disease because they smoked? NO! No one deserves this horrible disease! Today LC needs to be on the radar screen for everyone, not just people who smoke. I hope in the years to come LC will get the recognition of other cancers, and a cure will be found. I tried to return to my life before cancer, but found it was impossible. My whole world had been shaken and I realized that I would never return to the life I had led before. I was a survivor and I was determined to help other people diagnosed with lung cancer. The best thing that I found on the internet while researching lung cancer, was the Lung Cancer Support Community. It was an on-line community of over 7000 members who had been affected by lung cancer. Some were survivors, some were caregivers, but they were the most caring bunch of people I have ever known, and I certainly needed that. Although I will have to get a CT scan and visit my doctor in Baltimore every year for the rest of my life, it is a small price to pay for saving my life. By far, my biggest challenge has been conquering the fear of recurrence. Some days are almost worry free, others are not. The fear is always there. But I’m proud to say that I am now 10 years cancer free! After 5 years the doctors call you “cured”. What a nice word. I may be cured, but I am still a member of the cancer community and always will be. I will continue to advocate for lung cancer research until we have a reliable early detection method and adequate funding for research so that everyone else can be as lucky as I am! I'm so glad you contributed this. I have something similar, except my nodule is on my left and so is the stabbing pain. I also thought it was my heart. I am wondering how tiny your mass was. My doctor does not believe non-smokers get lung cancer. Gengal - My mass was just under 3cm. Insist that you get a CT scan! Early detection is the key to surviving lung cancer. I was so fortunate that my doctors were persistent. If he won't do it, see another doctor. 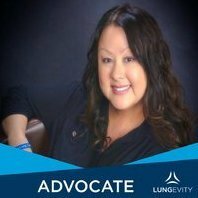 Lungevity has a lot of information! Print it out and take it to your doctor. You need to be your own advocate. Good luck....I'll be praying for you. It's amazing how similar our stories are...mine started with a stomach pain. Tomorrow I celebrate my 3 year "cancerversary". God bless you and many others!! Our stories are so similar. I too was admitted for what I thought was chest pain. All of my heart tests were normal but there was a nodule on my right lung on the CT scan. My primary md said, we will watch it and repeat CT scan in 3 months. I said no way. I work with cardiothoracic surgeons and begged for their advice, out patient PET scan was suggested. Again primary md refused, at this point I went to my old oncologist and begged for a PET scan. PET was positive for lung nodule only thank God. Now I had to beg everyone to take it out without any of us knowing what it was and I didn't want a biopsy, Just take it out!!! Well what do you know, it was SC adenocarcinoma and I had my right lower lobe removed. All the physicians could say is thank God you were so persistent. I have been a nurse for 29 years working open heart and lung surgeries. I wonder how many of my past patients were told we will just watch it. It breaks my heart. I can only hope that these doctors change their plan of care with their new patients, especially with those like me who are none smokers.